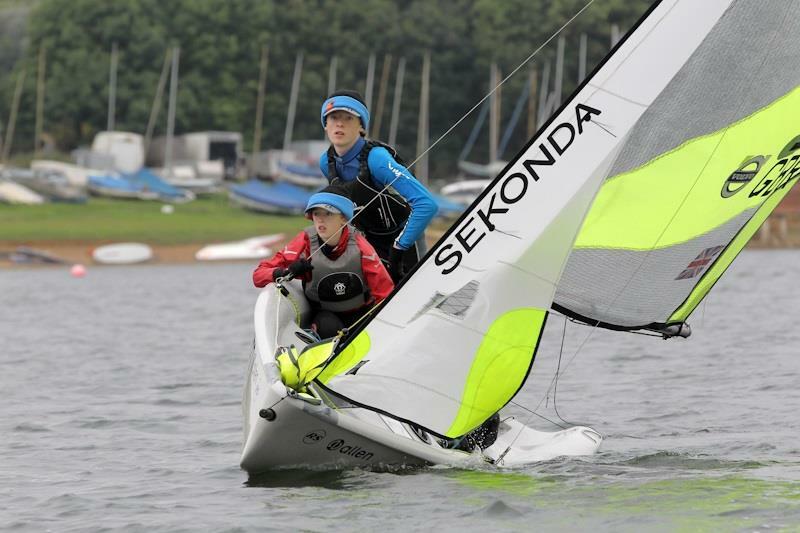 Forty-four boats from around the country attended the Volvo RS Feva Grand Prix at Northampton SC. The forecast of a light weather weekend held true & the first race got away dead on time in 7-8 knots in overcast grey skies. First mark leaders were Finley & Daniel Armstrong followed by James Hammett & Ben Todd. By the end of lap 2 James & Ben were ahead followed by Will & Matt Taylor with Hannah & Madeline Bristow in 3rd. By the finish the wind had increased to 8 knots & shifted left with James & Ben 1st; 2nd Hannah & Madeline; 3rd Will & Matt. The second race started & Will & Matt took the lead; 2nd Harry Barker & Matt Beck. The race was shortened as the wind dropped away to a drift. Will & Matt held on for a win; 2nd Harvey Martin & Bobby Hewitt; 3rd James & Ben. Race 3 got away under black flag as the wind came back to 6 knots & the sun came out. At the end of lap one Harvey & Bobby lead from Harry & Matt. Positions they held to the finish with James & Ben in 3rd. 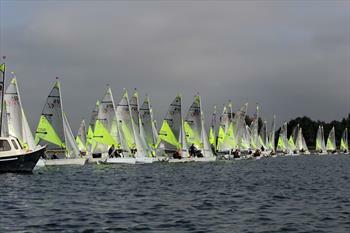 As the wind held & Sundays forecast was poor, the Race Officer decided on a 4th race. Again the start was all clear, on a black flag. At the end of lap one Jack Lewis & Lucas Marshall ahead with Will & Matt in 2nd; followed by Finley & Dan. By lap 2 Will & Matt took the lead; 2nd Finley & Daniel; with Harry and Matt third. At the finish Will & Matt secured their second win; 2nd Harry & Matt; 3rd Finley & Daniel. On the second day the fleet were greeted with glorious sun but light and shifty winds. Race 5 was away clear under a black flag. Harry & Matt had a good lead by the leeward mark. James Leetch & Jemima Leedham were second; followed by Finley & Dan. The wind stayed constant at about 5-6 knots but still very shifty. The finish of race 5 was 'neck & neck' with Harry & Matt just beating James & Jemima; 3rd Finley & Daniel. The final race saw one boat caught black flag & the wind still light and shifty. James & Ben lead at the leeward mark. 2nd Will Spurway & Ed Conlan followed by a very close chasing pack. Entering the last lap it was Will & Matt ahead of James & Ben; 3rd Dan and Elliot. On the last beat Will & Matt took a commanding lead which they held to the finish to secure the overall win. A tight pack followed with Harvey & Bobby 2nd; James & Ben 3rd.